SHD provides educational materials and programs to hundreds of faith-based, senior, community, and healthcare organizations. These materials help individuals and families prepare for end-of-life medical decisions. To download any forms on this page you will need Adobe Acrobat. Are you part of an organization interested in addressing end-of-life issues? E-mail SHD or contact us at (916) 851-2828. Produced by the California Coalition for Compassionate Care and distributed by Sacramento Healthcare Decisions, the 11 x 17 posters use colors to promote early conversations, advance directives, pain managment and palliative care. Also available in Spanish,the posters are being distributed in community and healthcare settings. Post on a bulletin board at a faith community, senior center, healthcare setting or local library announcing a scheduled group discussion, e.g. Talking It Over. 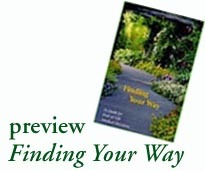 Announce the availability of educational materials like Finding Your Way. Include information about a class on advance directives. Indicate where advance health care directive forms are available, or list the person in your organization that can help people complete the form. Post in outpatient clinic, hospital inpatient unit or waiting rooms, nursing homes. Other suggested posting places: health fairs, senior and community centers, adult day health centers, public libraries and bookstores. The Community Education Kit is available for $20 to California purchasers; $35 to groups outside the state (includes applicable taxes and shipping). During 2000-01, SHD conducted 11 "Helping People Prepare" trainings throughout California for facilitators of Talking It Over discussions. The Robert Wood Johnson Foundation and The California Endowment provided funding support. 341 trainees from Chico to San Diego attended, representing faith communities, healthcare organizations, senior groups, hospices, community organizations, educators and individuals. 13-page booklet uses clear, accurate information to help those who are starting the advance care planning process or considering whether to initiate or withdraw life sustaining treatment when the end of life is near. Also available in Spanish. SHD began the ECHO (Extreme Care Humane Options) project in 1994 to find community consensus on the often difficult subject of using life-sustaining treatment for those who are terminally or irreversibly ill. This was a community-wide project involving almost 1,000 local residents in discussion groups; a telephone survey; and committees of healthcare professionals. In January 1997, the ECHO Community Recommendations were published targeted to acute care hospitals in the four-county greater Sacramento region. Since then, 6,500 copies of these recommendations have been mailed on request to healthcare facilities throughout the country. Almost every hospital in the Sacramento region adopted the recommendations and instituted changes in their policies, practices and programs. Following the publication of the ECHO Community Recommendations, SHD convened a statewide ECHO Long-Term Care task force to address this same issue in skilled nursing facilities. In January 2000, the ECHO Nursing Facility Recommendations were published and mailed by the California Department of Health Services, Licensing and Certification, to all 1,400 skilled nursing facilities in the state. This task force became the core group that formed the California Coalition for Compassionate Care. The Coalition now sponsors annual training programs for staff of skilled nursing facilities in the state. For more information, contact the Coalition's Executive Director Judy Citko at 916-552-7573 or by email.